This is our first Panda bear of 2013. He is 3 1/2" tall and is called Lo Wu. 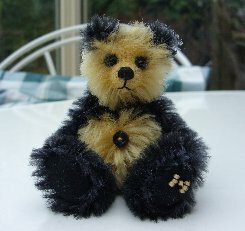 He is made of dark charcoal grey backed, black Schulte mohair, soft and very silky with a lovely shine. For his paler parts we have used bright gold Schulte mohair of a similar length and this also has a shine. Lo Wu has black ultrasuede pads and paws, he is steel shot filled for weight, has painted panda markings and shiny black English glass eyes and a black stitched nose. We have filled Lo Wu with steel shot for weight and so even though he is only small, he is quite heavy. As you can see, Lo Wu is a very cute bear and we do hope that you like him. He costs £39 plus postage. Please note that as with all our bears, Lo Wu is not a toy and is not suitabe for children. Sorry - Lo Wu has been adopted.